I had the privilege of working with two outstanding National Moot Court Competition (NMCC) teams again this year. The Region VIII round of the NMCC was hosted by Marquette this weekend and included ten participating law schools. This year Marquette won the regional competition, winning all five of their rounds and advancing to the nationals in New York City this coming February. Please congratulate team members Hans Lodge, Brendon Reyes, and Robert Steele, whose team advanced to, and won, the final round of competition (top team out of sixteen). The team additionally received the third highest brief score at the competition. Attorneys Emily Lonergan and Jason Luczak coached the team. Please also congratulate team members Andy Gordon, Mindy Nolan, and Kaitlyn Reise for their performance at the competition. 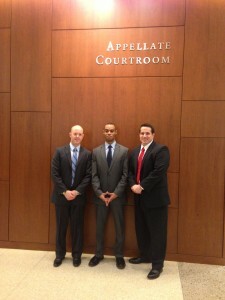 Attorneys Jesse Blocher and Michael Cerjak coached the team. The NMCC is sponsored by the New York City Bar and the American College of Trial Lawyers. Over 180 law schools compete across the country. This year’s issues were 1) whether a fictional beverage and bottle act’s posting requirement violated a fictional association of beverage producers and retailers’ First Amendment rights, and 2) whether the act’s unique mark requirement violated the dormant commerce clause. I am grateful for our teams’ hard work; they put in many hours of practice to prepare for the competition (sometimes practicing three or more times a day). I am also grateful for the time donated by the Marquette Moot Court Association, and in particular, Mike Beckman, who chaired this event. Thank you as well to the many judges and lawyers who judged the briefs and oral arguments for our NMCC regional, and who, year after year, enthusiastically support this large endeavor. This year we had judges drive from all over Wisconsin for the event, and one judge even flew in from St. Louis to participate. Finally, thank you to the individuals who judged the teams’ numerous practice rounds. We will be calling on practice judges for the next few months to help us prepare for the nationals. I can’t wait! Congrats to all of these talented students! Very impressive! Congrats also to Mike Beckman and the students on the Moot Court Board for making sure this tournament ran smoothly over the weekend. Special thanks to Prof. Melissa Greipp for her tireless efforts in all things moot court-related. Count me in for help with practice rounds, please. Congratulations to the team and its coaches!